It is warming up! Sure sure, the temperature is going to drop over the weekend, but I am going to enjoy it while I can! M & I did some spring cleaning over the weekend. I know it doesn’t sound very exciting but it was so liberating to get rid of so much garbage. While looking around the house we realized we were in need of some more storage. We are planning on making a storage bench for the dining room that can double as seating for when we have our extravagant dinner parties. (Yes I am poking fun at us.) 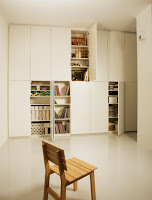 While surfing around the other day I found a design firm called TAF that has really interesting storage and was thinking maybe we can pattern our bench after their low red cabinets. I love the idea of having a whole wall devoted to covered storage and although it wouldn’t really fit in this apartment when we one have a house, I will make sure we have something along these lines.